We welcome you to Devil's Kitchen Cabins, owned and operated by Lynn and Jan Bush. We have both lived in the Jackson/Williamson County area all of our lives and truly love living in Southern Illinois. We are the fourth generation of our family to live on this property. We have two cabins available for rental on our 80 + acre propery. Our log cabins ars located deep in the woods of Southern Illinois, in the midst of several thousand acres of the Shawnee National Forest, and is adjacent to the Crab Orchard National Wildlife Refuge, Devil's Kitchen Lake, Little Grassy Lake, Crab Orchard Lake, Cedar Lake and Lake of Egypt. We are centrally located, approximately a 10-15 minute drive from Carbondale, Marion, Herrin, Carterville and Goreville. We are also located less than a 30-minute drive from Kincaid Lake and Rend Lake. Hiking trails that wind all around Devil's Kitchen Lake are adjacent to our property. Our cabins are located in a very secluded area and we bring to you a private retreat in the middle of spectacular woods, with all of the comforts of home. Our rustic log cabins are designed to sleep 4 guests comfortably, and you receive much more value than at most motels at no additional charge. Ideal for a family retreat or a romantic get-away, one price includes all amenities. 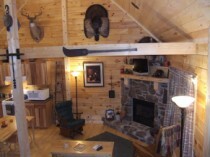 Our cabins provide affordable lodging combined with the relaxing atmosphere of the great outdoors.